Every amateur historian of World War Two knows the importance of letters. 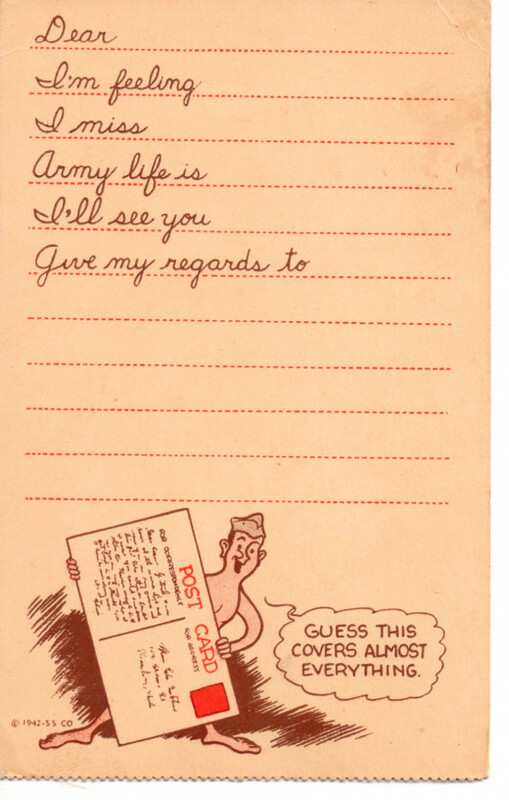 Americans kept in touch throughout the war mainly by writing letters to one another. Letters kept loved ones in touch with the daily happenings of soldier's lives and reminded them that they were still in their thoughts. 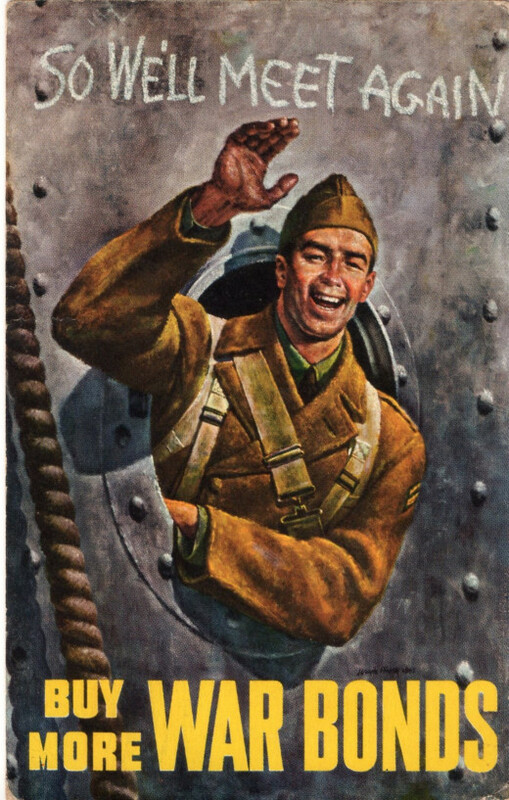 Much of military life was new to a generation of men who had been recently drafted away from their civilian lives. 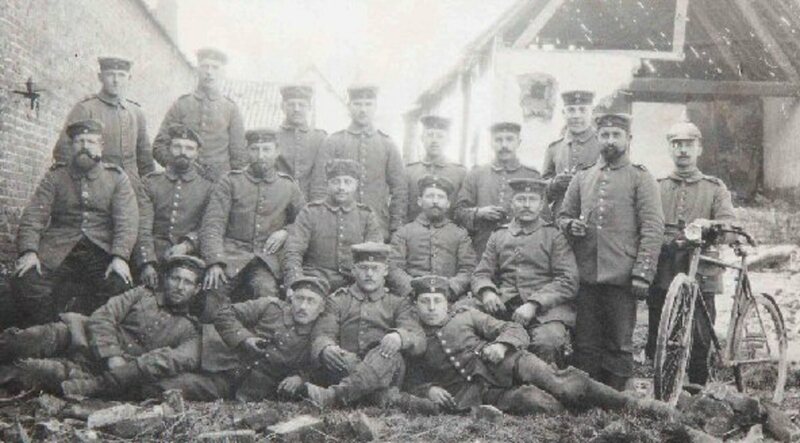 Often bored and alone, soldiers consoled themselves with correspondence from home, their parents or their girlfriends and wives. Mail call was the most important time of the day for many of the new draftees, and young boys who had never been away from home could escape the drudgery of military life with just a few lines from their mothers. 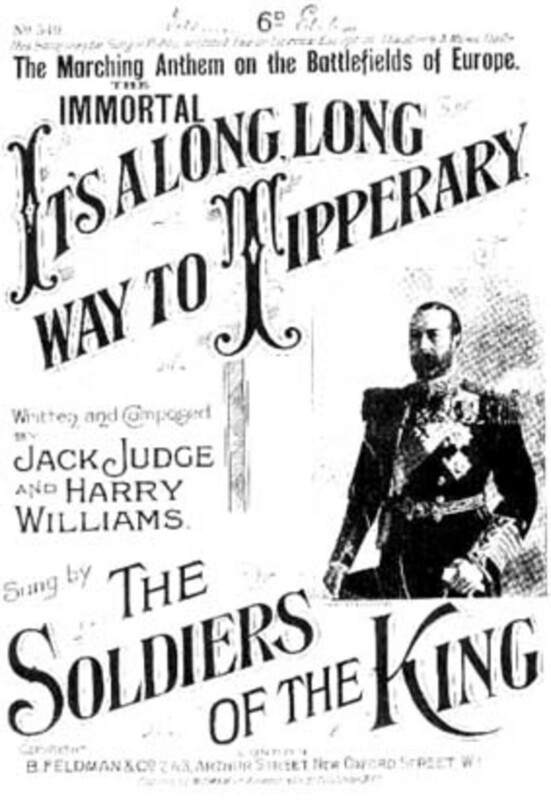 As a result, companies and the government looked to either profit from or assist soldiers. 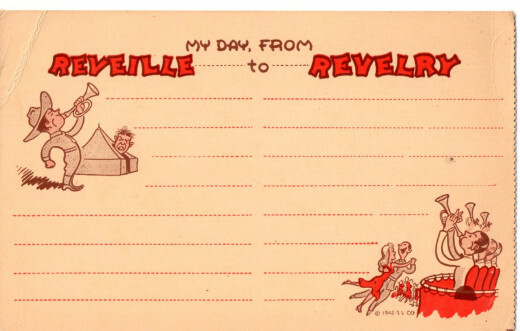 Different letterheads, envelopes and postcards were developed to amuse or educate civilians. 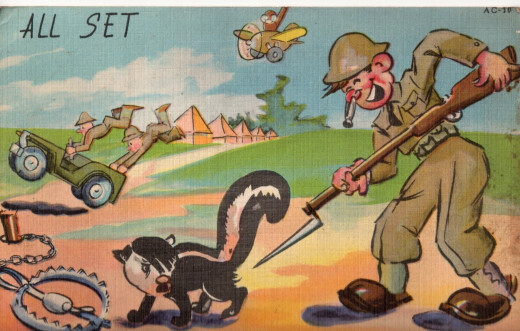 The following postcards illustrate a small sampling of types manufactured during World War Two. 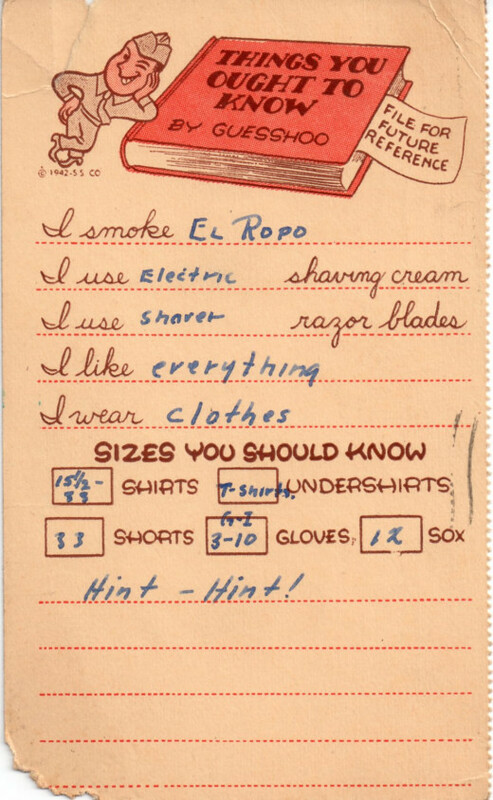 Soldiers purchased stationary at the Post Exchange for relatively cheap prices. 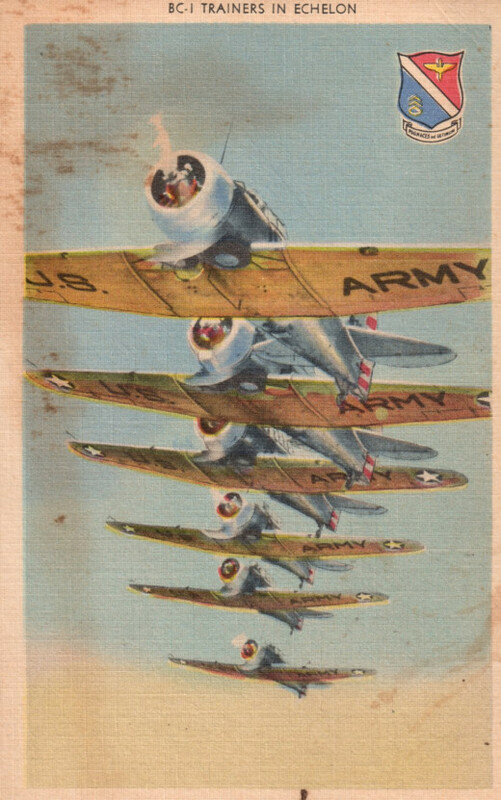 Postage was free for soldiers during the war and although there were at times few options, postcards were of decent quality. Various units had their personal logos embossed on the top, often with a unique emblem of some sort. 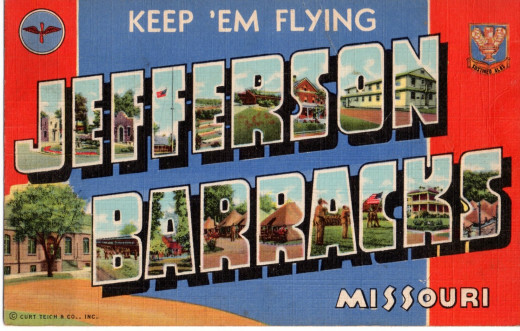 Post cards were also easy to buy, and sets were fun to send to loved ones, curious as to the happenings of their recently departed soldiers. In response, publishers created cards about cities, armaments, camps and bases. Soldiers were able to purchase these cheaply and send them home, which helped explain where they were and what they were doing. 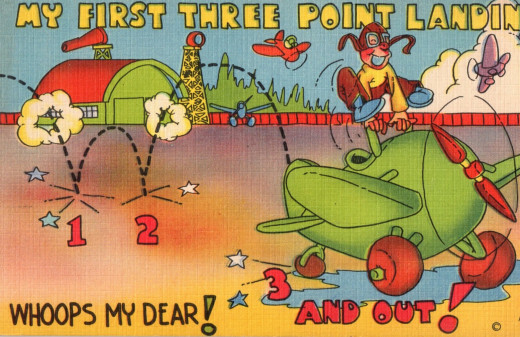 Some themes included American aircraft or military equipment, comic strips and even fill-in-the-blank type cards where soldiers simply filled in a few lines and sent off the card. 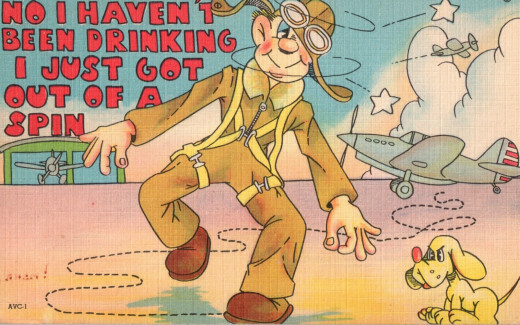 Basic examples of postcards include pictures of aircraft, a montage of a base or field, and propaganda including bond sales. 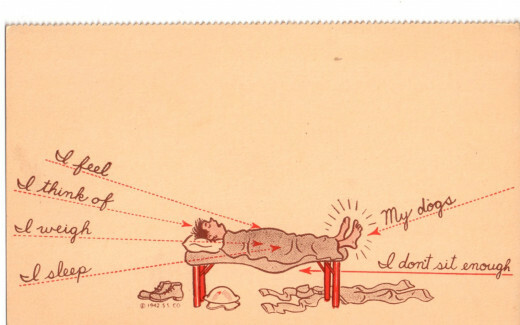 Many postcards were often ready-made, whereby soldiers needed only to fill out basic information. On the back, they could continue their message, but some simply filled out the front and sent it off, lacking the time or energy to write a longer letter. 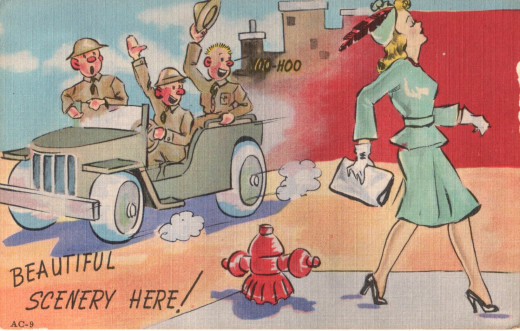 Whatever the reason, these postcards helped to inform the soldier's loved ones what life was like, or what was needed to alleviate any issues these young recruits had so soon after leaving home. Eager and alert is the attitude of new cadets arriving at the S.A.A.C.C. for their training as Bombardiers, Navigators and Pilots of the Air Corps. "Don't argue with the barber. 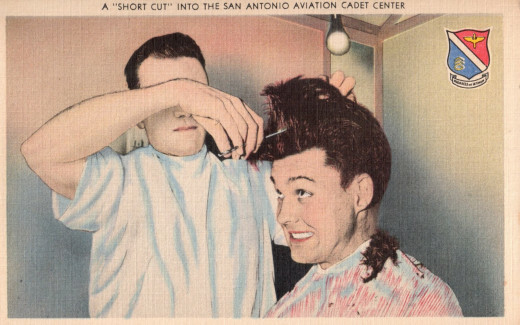 Hair cuts are mandatory," reads the sign in S.A.A.C.C. barber shop. "The Classification Clip" is the name givin these "short cuts" by S.A.A.C.C. cadets. 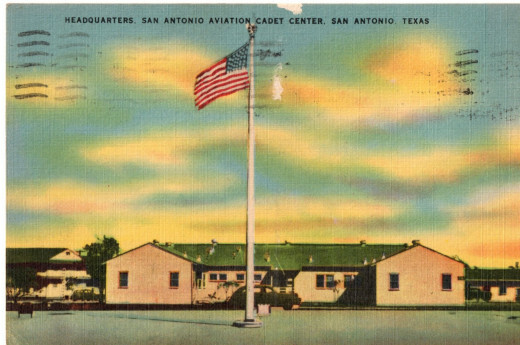 This (sic) the Gateway to the largest Cadet Center in Texas, the San Antonio Aviation Cadet Center. Cadets at SAACC just after returning from lessons in "Aviation Calisthenics" designed to give physical fitness to Uncle Sam's fledging fliers. These "exercise pilots" are on their way to wings and commissions in the A.A.F. and are now in pre-flight. 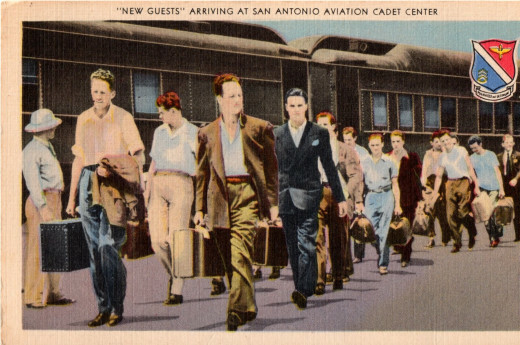 The aim of every man classified as a pilot at the San Antonio Aviation Cadet Center is to reach as quickly as possible the day when he and his classmates march to the flying line for the first time. 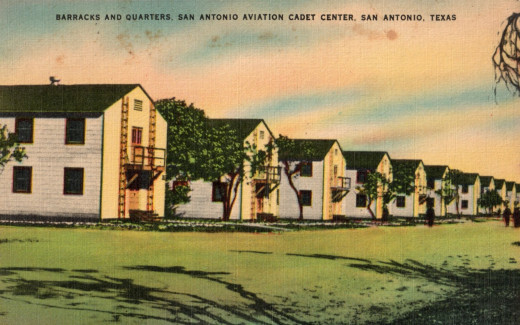 Barracks and quarters at the San Antonio Aviation Cadet Center to house "10 acres of flying Cadets." Aviation cadets classified as navigators at the SAACC eagerly look forward to the day when as students at navigator schools they will learn the art of charting the course of a combat plane. 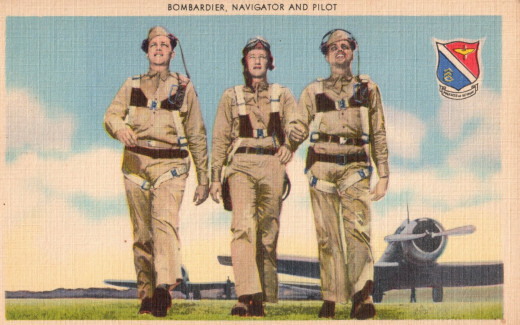 These Air Crew officers, bombardier, navigator and pilot, started their Army Air Forces training at San Antonio Aviation Cadet Center, the largest aviation cadet training center in the U.S. 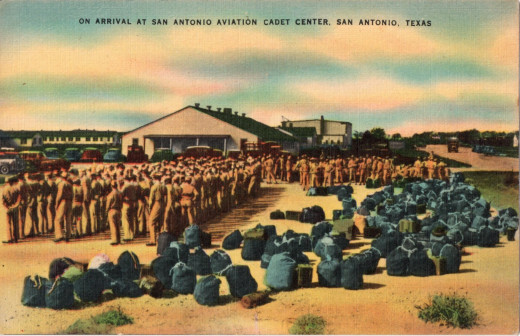 The following represent a series of postcards that were published to help civilians understand what their husbands or sons would be going through after entering "pre-flight" at San Antonio Aviation Cadet Center. Most cadets entered their pre-flight training at Randolph Field. Randolph Field, combined with Kelly Field located a mere five nautical miles south, graduated tens of thousands of aviation cadets during World War Two. 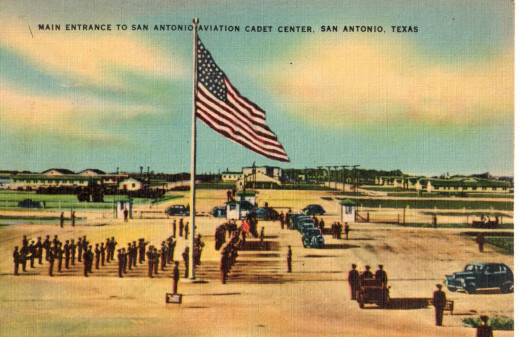 Moreover, the city of San Antonio itself was a large military city, holding both air fields as well as Brooke Army Medical Center, Camp Bullis, (a processing center) and historic Fort Sam Houston. 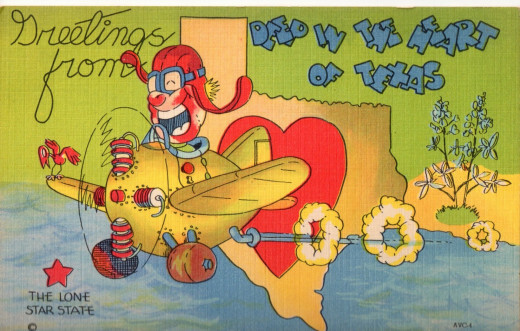 In fact, over eleven separate Army facilities were located in or near San Antonio. South Texas’ temperate climate combined with vast, cheap acreage allowed the United States to expand its facilities as needed. 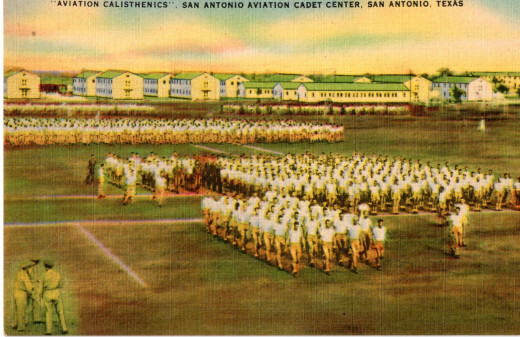 Kelly Field changed its name in 1943 to the San Antonio Aviation Cadet Center (S.A.A.C.C.) 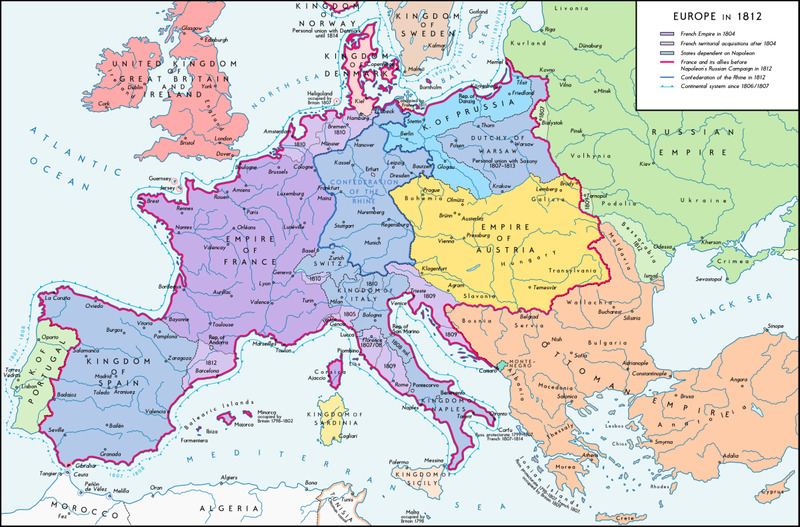 whose mission was to train pilots, bombardiers, mechanics, navigators and gunners during the course of the war. 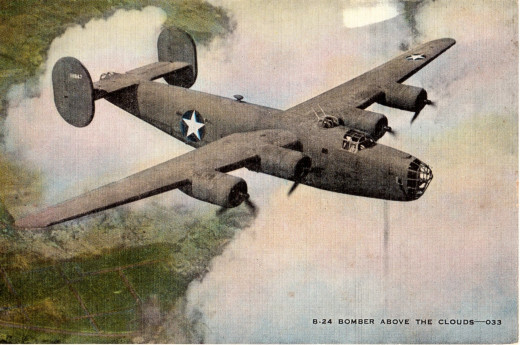 Early in the war, the base’s primary charge was multiple engine bomber training, but by 1943 the name changed also meant a shift to aircraft maintenance and supply, a mission that is ongoing to this day. Back at Randolph Field, cadets underwent a vigorous and thorough curriculum of classes combined with military drill. Physical training concerted with marching drills were common place. Parade formations and P.T. 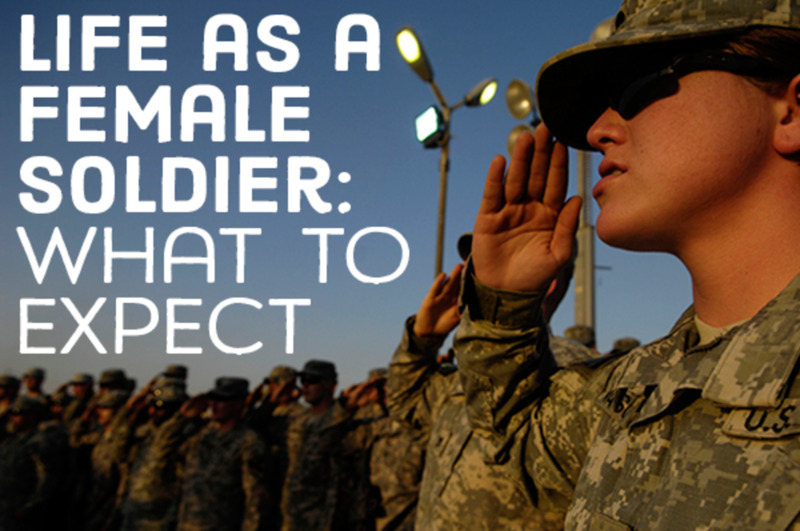 became much longer and more intense than what men experienced in basic training. 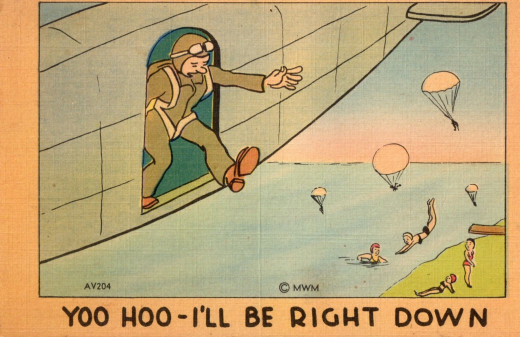 Known as "pre-flight," every man was subjected once again to various physical, aptitude and mental tests. Named after Captain William Millican Randolph who was on the base naming committee at the time of his accidental death as a result of an airplane crash, Randolph Field was known as the "West Point of the Air." The large airbase housed the Army Air Forces Central Instructors School (CIS) which trained instructors for both flying and ground schools. 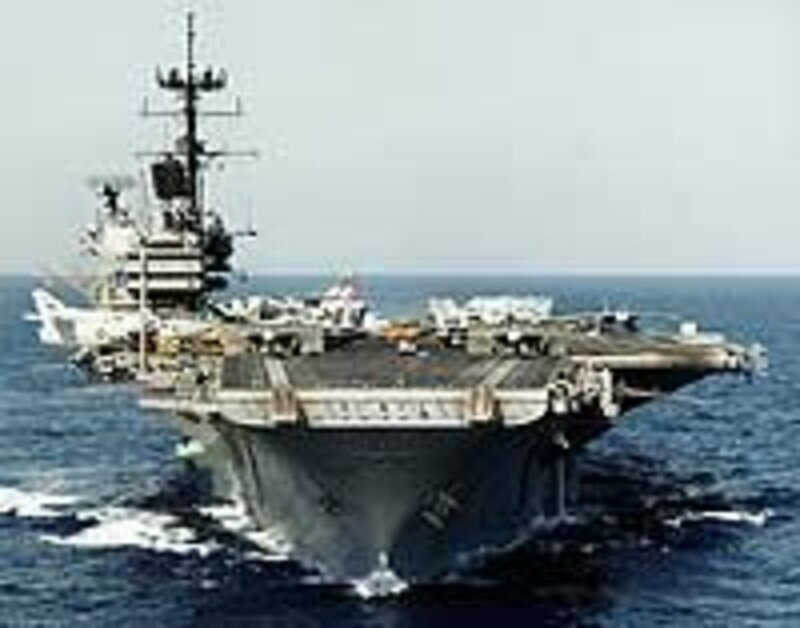 In addition, the base trained cadres of men for shipment to pre-flight training on other bases throughout the United States. 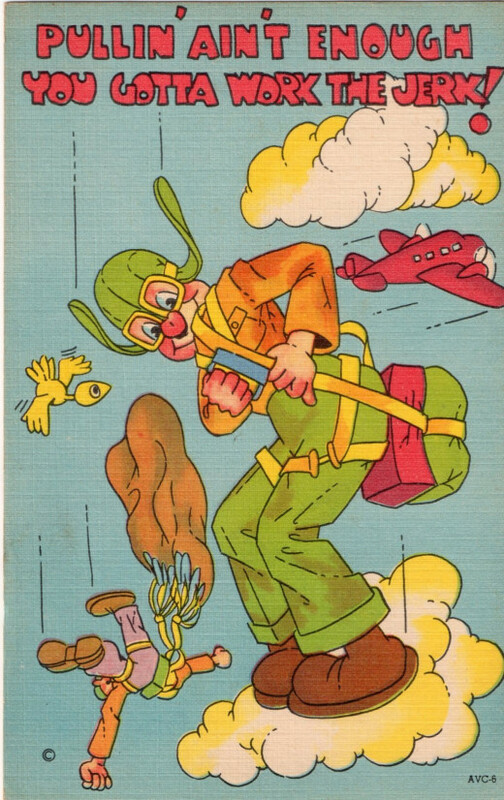 By 1944, Army training doctrine changed and created longer and more realistic training throughout the Air Corps. 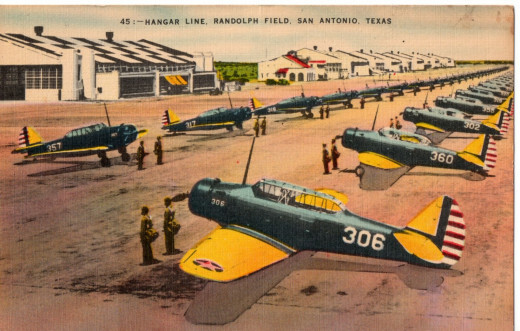 Although basic flying training had been integral to Randolph’s mission, it was discontinued and transferred to Goodfellow Field in San Angelo, Texas so that SAACC could focus more intently on pre-flight. 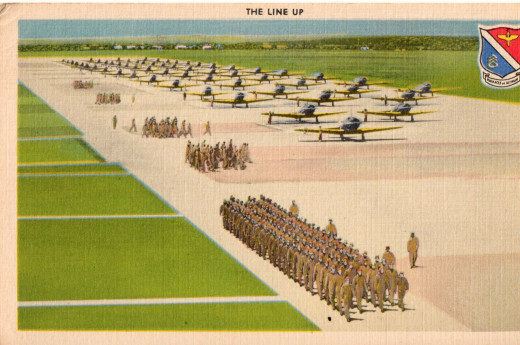 From late 1943 to the end of the war, the primary mission of Randolph Field was to prepare men for their next assignment, which most of the enlisted men hoped would be basic flight training. 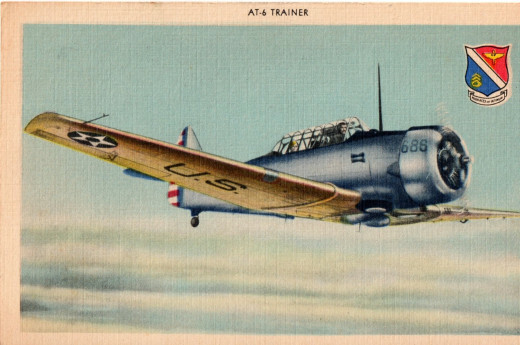 Their schooling consisted of a larger variety of classes which were oriented more toward actual combat flying. 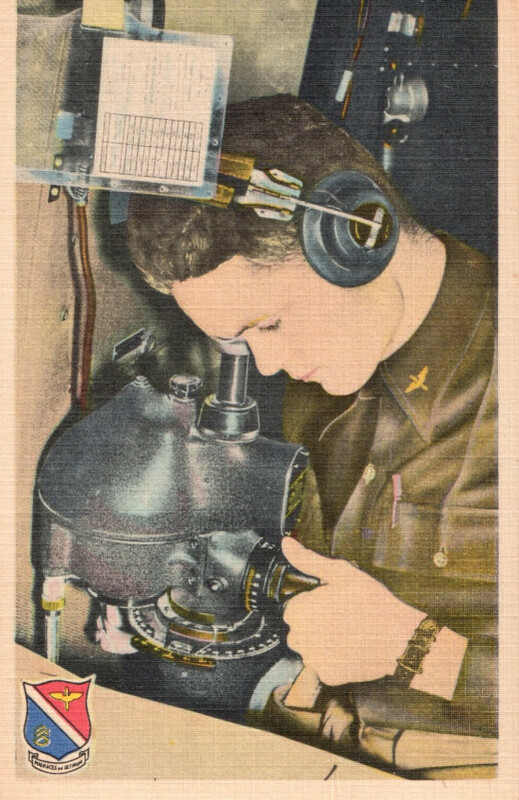 Aircraft recognition and code recognition combined with the usual physics and math regimen were to keep the men busy for the next five weeks. 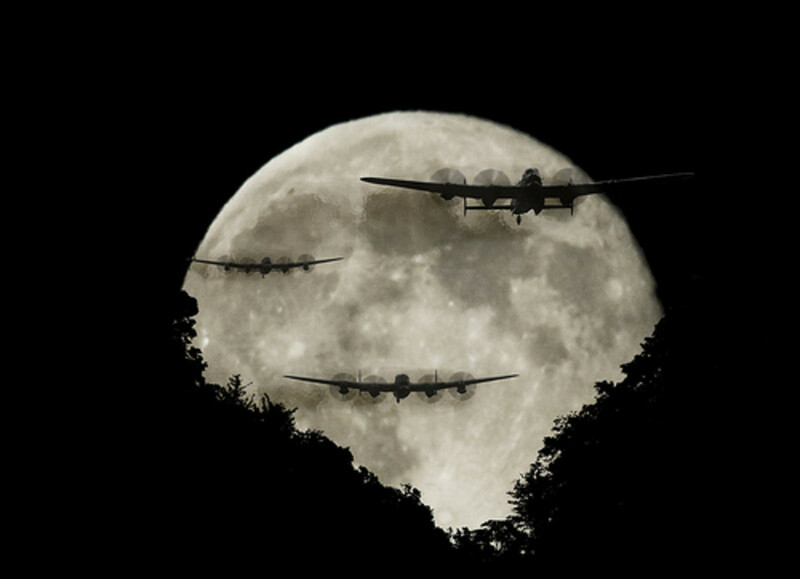 The men were shown silhouettes of aircraft at 1/10 of a second and had to have 100 percent accuracy. Some of the photos were camouflaged aircraft parked on the ground, or seen at far distances, and both enemy and friendly aircraft were shown. 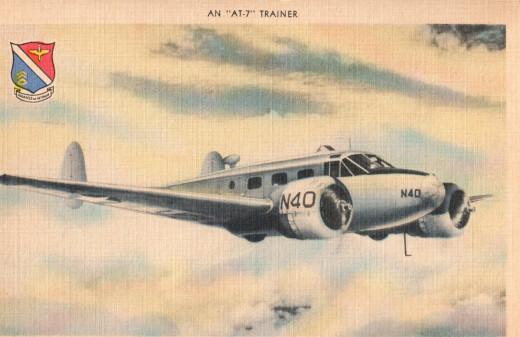 Almost daily were lectures, classes, films or tests on high altitude flying, code, math (navigation, plotting courses, ground speeds, headings, airspeeds, etc), parachute drills, a battery of psychomotor and physical tests including eye tests, depth perception, pressure chamber tests as well as the random doctor’s physical. 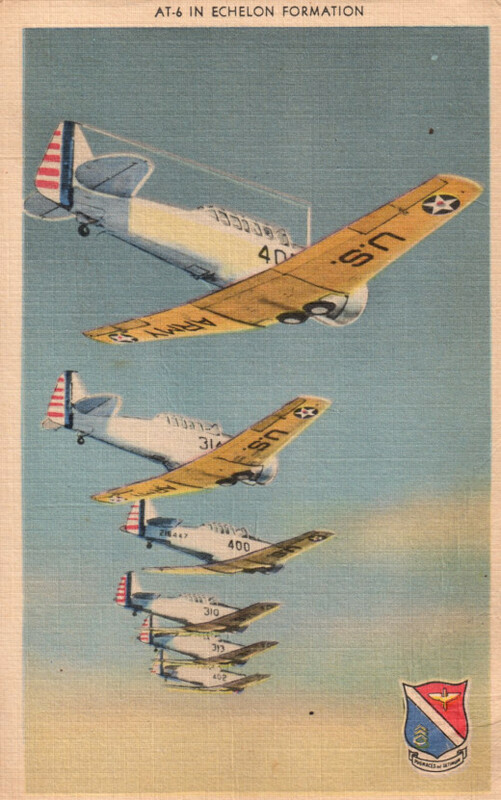 The following set of postcards illustrate either the training aircraft inventory at Randolph Field or certain formations that the cadets would soon master. 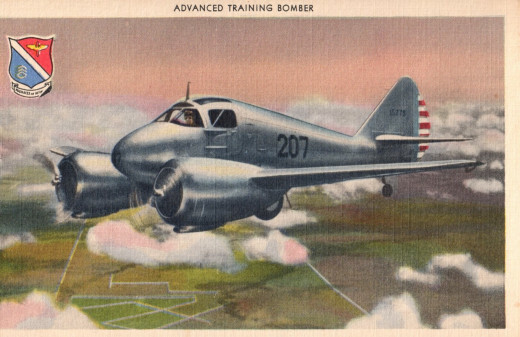 Each postcard had the following written on the back: "Cadets at the San Antonio Aviation Cadet Center will soon take to the skies in the roles of Bombardiers, Navigators and Pilots. 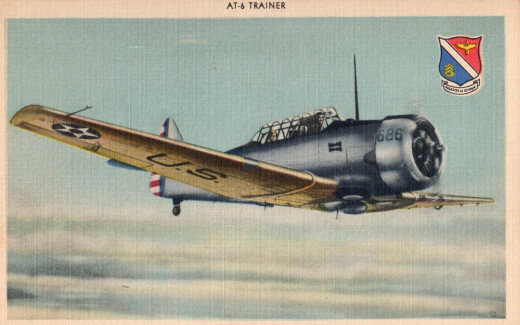 Pictured is one of the types of training planes in which cadets will receive further training, according to their classifications, after leaving the cadet center." The reality of training was not often published. Soldiers did not want to bring unwanted fear to their loved ones, and the military did not want to create nervousness among the troops. 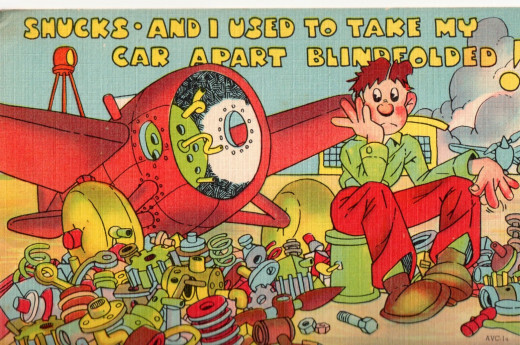 As a result, this is often reflected in many postcard's front cover as well. The following represent a lighthearted attempt to allay fears about training and the soldier's eventual deployment overseas. 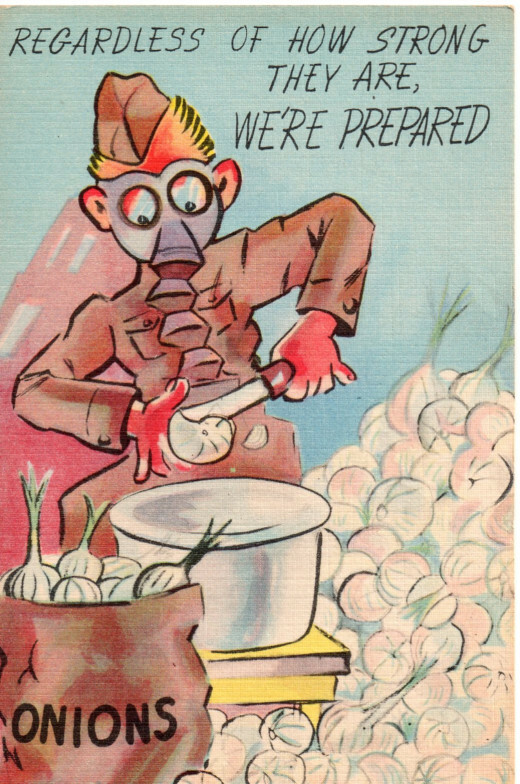 Many different styles of postcards and stationary were available during the war. 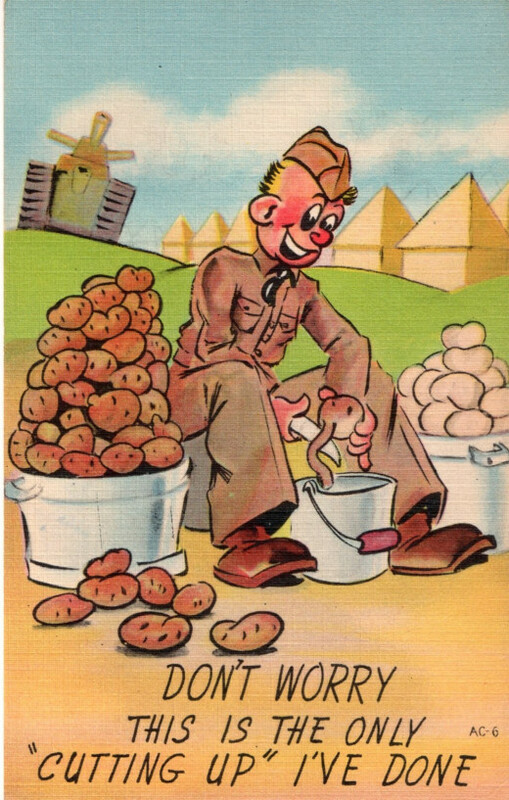 Depicting many different themes, from aircraft types, base facilities, cities or creating a lighthearted view of army life, postcards were essential for morale. Writing letters helped soldiers in myriad ways, including giving and receiving information from home as well as simply passing the time. An interesting selection of postcards and information. It would be good to see what the corresponding British ones were like; I've seen a few but I'm sure there must be some in similar categories. This kind of history is just as important as the more 'traditional' type; it gives a great social picture and brings humanity to the war situation. How these soldiers got through being so far away from home was helped by things like these, as well as food parcels and tobacco tins (WWI). This is an avenue of research not often explored. 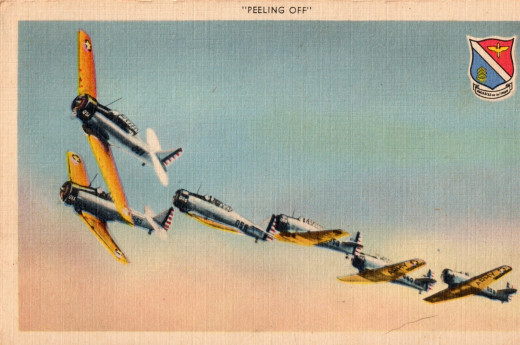 Yet postcards presented a quick and easy way to communicate, much like e-mail or text messages today. And if one was very clever, one could write the contents of a whole letter on but one-fourth of its surface. 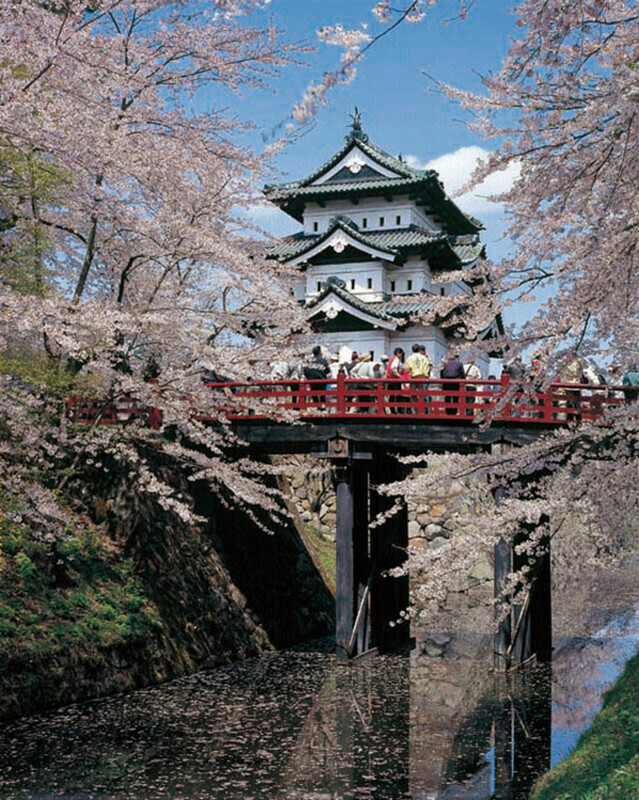 They represent one of the more interesting aspects not only of communication, but also of art and history. Thanks for posting!